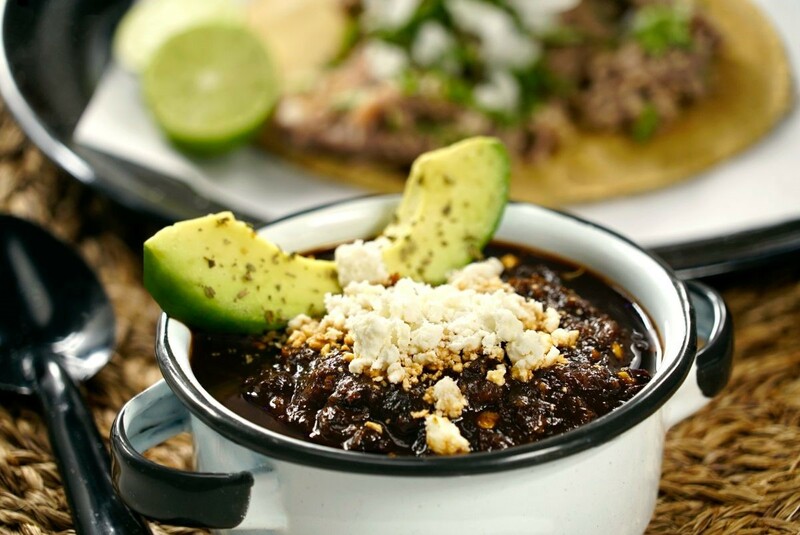 This sauce is traditionally served with barbacoa (pit-cooked lamb, goat, pork, or beef), but makes a great all-purpose salsa, as well. The alcohol is burned off in the cooking process, leaving only its musky flavor. The sweetness from the freshly squeezed orange juice gives this salsa a wonderful balance. Cook the chiles in a dry saute pan over high heat turning constantly until slightly toasted, about 2 minutes. Remove from the heat and when cool enough to handle, cut them in half and remove the seeds. Tear them into small pieces and add them to a blender. Add the orange juice, tequila, garlic and olive oil to the blender. Puree the salsa and add it to the same saute pan used to toast the chiles. Cook until slightly thickened, about 5 minutes. Season the salsa with salt and pepper. Cool completely. Transfer to a serving bowl and top with crumbled añejo cheese.